Under the Affordable Care Act, WV Medicaid now offers insurance coverage to some individuals and families who were not previously eligible. 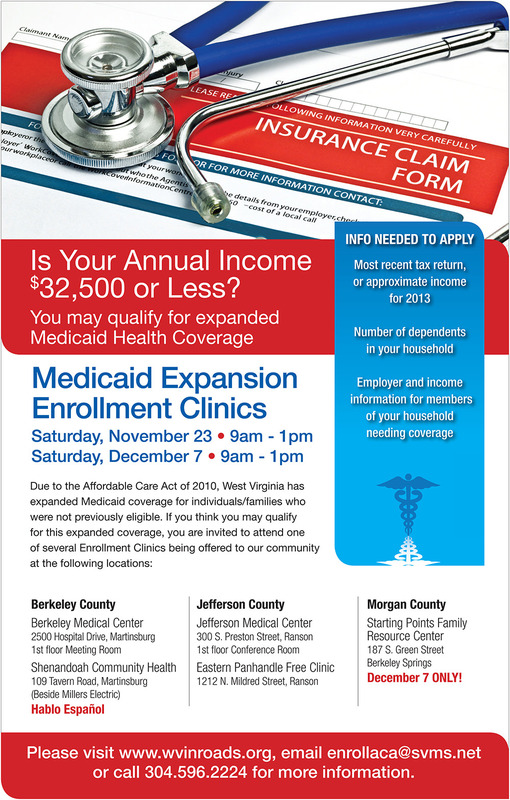 To assist in enrollment, several organizations will be offering enrollment clinics throughout the tri-county area. The first clinic will be held on Saturday, November 23rd, from 9:00AM - 1:00PM at the following locations: Berkeley Medical Center, 2500 Hospital Drive in Martinsburg; Shenandoah Community Health Center, 109 Tavern Road in Martinsburg; Jefferson Medical Center, 300 S. Preston Street in Ranson; and Eastern Panhandle Free Clinic, 1212 N. Mildred Street in Ranson. An additional clinic will be held on Saturday, December 7th from 9:00AM – 1:00PM at the same locations as well as Starting Points Family Resource Center, 187 S. Green Street in Berkeley Springs. Spanish-speaking staff will be available at Shenandoah Community Health Center during both clinics. Appointments are not necessary and both clinics are free of charge. Individuals should bring the following information: most recent tax return or approximate income for 2013; employer and income information for household members needing coverage; and the number of dependents living in the household.